On May 5th and 6th, the Sumida River Renaissance along with a few other organizations and businesses held the first ever Tokyo Hotaru. 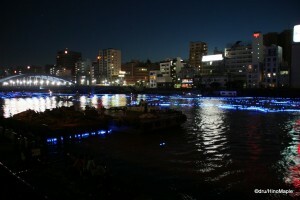 The Sumida River Renaissance is an organization that works towards the beautification and reformation of the Sumida River. In the past, the shores of the Sumida River became populated and the river was polluted due to commerce. In collaboration with the Tokyo Metropolitan Government and local governments, their goal is to clean up the river as much as possible as well as promote more leisure activities along the river banks. This year they started the first Tokyo Hotaru that brought many people to the Sumida River area with the goal of promoting the beauty of the river itself. 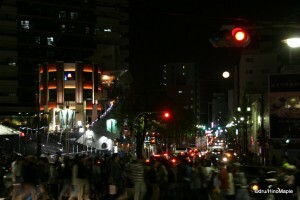 The Tokyo Hotaru was perfectly timed to coincide with the end of Golden Week in Japan. The final two days of Golden Week is when most people return to Tokyo to prepare for work. It was the last couple days for people to get out and try to forget about working again and it seems to have worked in favour of the Tokyo Hotaru. The promotion of the event was a little weak at first but it picked up very quickly. This year, the Tokyo Hotaru also had the joy of being the first official time Tokyo Sky Tree was lit up and also coincided with the super moon; the combination of these events led to huge crowds converging on the riverbanks of the Sumida River. Hotaru is the Japanese word for firefly, also called a lightening bug. Finding a lightening bug in Tokyo is a very hard thing to do. In my own research, I found only one place within central Tokyo where you can still see them. Chinzan-so is, from what I can understand, a restaurant with a private Japanese garden. From May until July, their dinner courses and rooms offer views of the garden along with fireflies that have been released into the garden. From their website, it looks to be an expensive affair but you can’t get any more convenient than Chinzan-so which is located in Waseda. I was not too surprised to see that they are only found in Chinzan-so as fireflies need a clean and natural environment that is similar to a swamp. I couldn’t find any information, but in the distant past, I heard Tokyo used to have lots of fireflies. When Tokyo was still predominantly a swampland near Tokyo Bay, fireflies were ever present. Today, most of this swampland has been reclaimed and it is nearly impossible to see fireflies naturally unless they were bred and released in that area. I have heard that there are one or two areas in Chiba that are still breeding grounds for the fireflies but they must be endangered. Due to the pollution of the rivers and lack of swampland, it is hard to imagine fireflies having ever lived in Tokyo. Fireflies are rarely seen natively in Tokyo, so recently, the Sumida Renaissance worked with an existing festival that has toured around Japan and created the Tokyo Hotaru. While the event started on the 5th with small activities, the main event was on the 6th. 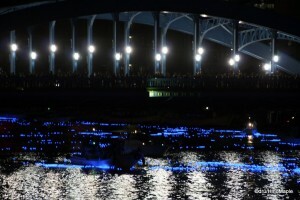 On the evening of the 6th, it was reported that around 100,000 blue LED bulbs were thrown into the Sumida River. This created the illusion of thousands of fireflies floating down the river. It was an amazing spectacle that was very beautiful and something I would enjoy seeing again next year. An interesting fact is that the blue LED bulbs were all charged with solar energy making the bulbs themselves mostly environmentally friendly; keeping in touch with the main theme of beauty and the environment. Thousands, if not tens of thousands of people lined the shores and bridges of the Sumida River and waited till 7:30pm when Tokyo Sky Tree was lit up. The second Tokyo Sky Tree was lit up, everyone, and I do mean everyone, stopped and took out their phones to snap photos. It was chaos to see everyone in near unison start taking photos. Very few people cared about anything other than taking a few photos. Within 30 minutes, most of the people had moved on and the event seemed to have started to die down. It was almost amazing to see such a panic of people trying to take photos the second the lights turned on as if there wouldn’t be another chance in 20 minutes. From what I could tell, the lights of Tokyo Sky Tree would have stayed on for at least an hour, but people can be pretty impatient. The future of this event is still uncertain. I only got a brief taste of the festivities as I had many other things to do on this date. I only had an hour or less to see the blue bulbs floating down the river as well as see some of the other places that were closing. I can’t imagine what will happen next year if things are this crazy. The organizers will have to work a little harder to make it easier for people to get around but other than that, it looked like a great festival. If it is held again next year, I will definitely go, but probably a day early to avoid the crazy crowds on the final day. My own personal sanity is very important and I doubt I’d want to risk losing it next year. For those who do decide to go, my guess is that things won’t be too busy and going towards the end of the actual event, say 8:15 or so is probably preferable. You may not get the best of the event but you won’t have to fight with all of the people to get your photos done in the first few minutes. This entry was posted in Festivals, Tokyo and tagged 2012, 2012 Tokyo Hotaru, Asakusa, Chinzan-so, Firefly, Hotaru, japan, LED bulbs, Lightning Bug, Sky Tree, Sumida, Sumida River, Sumida River Renaissance, Sumida-ku, swampland, Taito, Taito-ku, tokyo, Tokyo Hotaru, Tokyo Metropolitan Government, Tokyo Sky Tree by Dru. Bookmark the permalink. You went! Thanks for this (rather very excellent, may I add?) report! I imagined the crowds and chickened out. I just sat on the balcony, watching Sky Tree. I’ll try again next year, but I’ll go later, as you suggested, and maybe aim for a bridge a bit lower down. 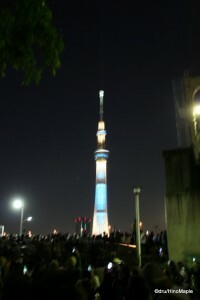 I started grinning when I read how everybody frantically took photos of Sky Tree. That tower has an uncanny power: it turns us all into slack-jawed idiots. Yeah, the crowds were nearly unbearable. I had guests in town and figured a crazy festival was in order. I wouldn’t be surprised if the fireflies are all “cultivated”, rather bred. It looks nice either way but someday I’d like to go somewhere that is more natural for them. Saw the crowd in the photos, and that already gave me a headache.